We know that vitamin D is essential in supporting the body nutritionally in a variety of areas including immunity, bone health, brain function, depression and a host of others. Now we are getting a better understanding of how vitamin D (specifically vitamin D3 contained in Dense Bone) is able to assist the body in dealing with chronic pain issues. Humans evolved outdoors, in the sunshine. Exposure to the sun’s ultraviolet radiation produces a hormone known as “vitamin D”. Vitamin D is critical for human health. The nucleus of all of our cells have vitamin D receptors. There is evidence that vitamin D influences the expression of about 10% of human genes.With very rare exceptions, humans cannot achieve optimal levels of vitamin D through diet alone. Although some foods are fortified with vitamin D, consumption of large amounts of such foods will not achieve optimal levels. To achieve and maintain optimal levels of vitamin D, we must either use vitamin D supplements or use the sun. James Dowd, MD, is an Associate Professor of Medicine at Michigan State University. He is also the founder and director of both the Arthritis Institute of Michigan and the Michigan Arthritis Research Center. He is board certified in internal medicine, adult rheumatology and pediatric rheumatology. In 2008, Dr. Dowd published a book titled The Vitamin D Cure: Five Steps to Heal Your Pain and Improve Your Mood. Same song — with a different verse. For a medical doctor from Michigan State University working with patients with chronic pain to state, “those who took Vitamin D supplements saw a dramatic resolution of pain, muscle fatigue and muscle cramps” is remarkable. 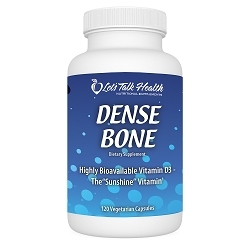 Dense Bone, our proprietary vitamin D formula, containing 2,000 IU of vitamin D3 in addition to vitamin K2 and strontium has quickly climbed to the top of our best selling formulas because people are getting more educated about the benefits of supplementing with vitamin D.
Editors Note: Remember… The vitamin D3 found in our Dense Bone is something that we should be taking daily for its cumulative effect on our body. If you are dealing with chronic pain, you may also want to consider also trying Relevit – our all-natural anti-inflammatory — in conjunction with Dense Bone. Its effects are much more immediate for those daily flare-ups.